I wanted to show you a bit of what I've been working on in class. Last week our teacher gave us free reign and let us use a whole class day to create a 'total look'. My classmate Troung let me use her as a model and this is what I came up with! 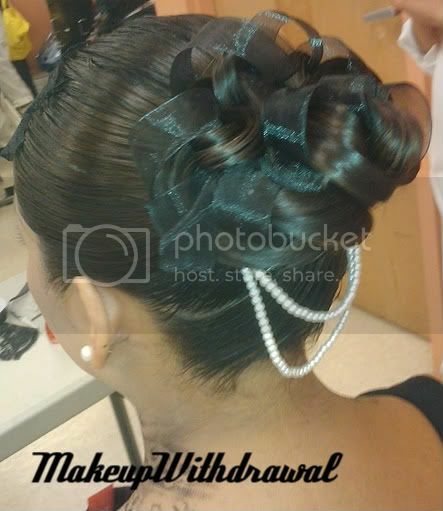 Another one of my classmates, Sandra worked on her hair while I did makeup and nails. I used repetition of lace and pearls throughout the look, starting with her finger tips. I started with acrylic nail enhancements (using CND products), then painted the nails a soft pearly-white. 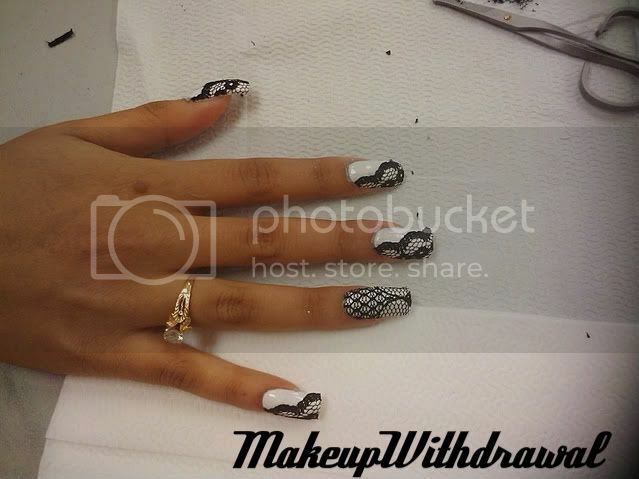 I then overlaid the lace with Odyssey Nail System's Gel Me Now. Boy did I learn a lot about working with lace! It's much harder than I thought it would be- it has a tendency to shrink and fray. Man, I hope I look this beautiful when I'm pregnant! I used lace and e.l.f. Cream Eyeliner in black and Savvy cake liner in black to stamp Troung's neck and arm. That didn't come out nearly as crisp as I had hoped, but I was pretty pleased with the effect overall. Eyes: Urban Decay Primer Potion, Stila Kitten, Milani Storm shadow, e.l.f. Cream Eyeliner in black and falsies. It was such a fun hands on learning experience, I wish we could do it again! Oh- I also wanted to show you my friend Vina's creation. Her model was our pal April, isn't her work exquisite? Thanks to Nuket for the pictures, Troung for being my model, Sandra for the work on the updo and Sandy for the dress!